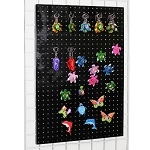 Gain the attention that your merchandise deserves with this 2-Sided Mobile Wood Gridwall Display. 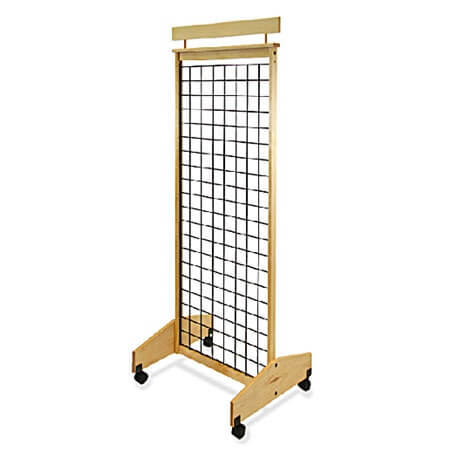 This natural wood display comes with a 25-inch wide double-sided welded wire grid panel and stands over 68 inches tall and has welded wire grid panels with a three-inch center. Including the casters, this portable grid display can be easily set up anywhere in your business that you need to add a little flair to and with 2 sides you can double your merchandise and potentially daily sales figures. Add a little rustic appeal to your store with this natural wooden store fixture that includes a wooden sign holder on-top to help you advertise your merchandise. Purchase your mobile floor display today at Candy Concepts Inc and add the appropriate accessories that you know will help sell your impulse materials.